Everyone can use an awesome LinkedIn tip every now and then. As a go-to platform for professionals, LinkedIn has provided both employers and job hunters the chance to connect and get hired. Wouldn’t it be amazing if you can land a job just by optimizing your profile on social media? Learning how to sell yourself on LinkedIn and other social media platforms can make a difference in your career. That’s why it’s helpful to be updated with the trends and tips. This way, you create an online presence that will eventually land you that dream job. So this week on Five Tips Tuesday, we’ll give you handy awesome tips and strategies you can use to optimize your social media profiles, get you noticed, generate leads and eventually land you a new sale. Get inspiration from a 33-year-old entrepreneur who’s made a fortune selling Kevlar pants online. Discover the power of LinkedIn endorsements. Find out the nine common Instagram mistakes social media managers should avoid. Learn about the new LinkedIn tool called Lead Generation Forms. And lastly, check out how small practices can change and save your life. Thirteen years ago, Trevor Chaplin was a broke college student selling pest control door-to-door. Driven by his will to change his life, he launched an online store and offered Mormon artwork. Like many businesses, Chaplin’s online store had a rough start. Realizing he was selling the wrong product, he ditched Mormon artwork and started to sell assorted items from China. Kevlar pants, inflatable chairs, and other intriguing products dominated his online store. With hard work and strategic use of Facebook and WeChat, Chaplin was able to earn $1 million in 92 days. Read his full story here and discover how he did it. 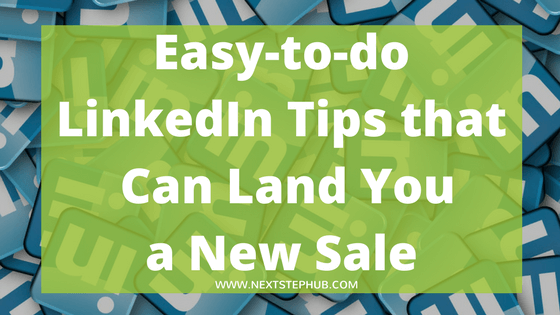 Optimizing your LinkedIn profile can make a difference between a simple connect and getting offered a new contract. LinkedIn is a powerful tool that can help entrepreneurs and professionals get recognized. One of the various ways to make your LinkedIn profile shine is by getting 99+ endorsements. The more endorsement you get, the more legit you appear. Neil Patel, co-founder of Crazy Egg, Hello Bar, and KISSmetrics, swears to the magic of LinkedIn endorsements. Check out his article and learn tactics on how you can get those 99+ endorsements. With more than 700 million users, Instagram is now widely used as a marketing platform. Like other social media sites, Instagram can boost your brand and your sales. But to achieve these, you should build a good strategy and avoid the mistakes Instagram marketers often do. Take note of these nine common mistakes social media managers should avoid. LinkedIn just recently launched Lead Generation Forms. It’s an awesome feature that allows advertisers to get more leads by filling in forms with accurate profile data. Learn about the benefits of this tool and how to create your own Lead Generation Form ad here. For more than ten years, Tom Rath, author of Eat, Move, Sleep, battled a serious illness in silence. He discovered how small decisions affected the length and quality of his life. According to him, there are three practices that can improve your health. Eat right, move more, and sleep better. In this book, Rath shared how his choices changed and saved his life. Start your journey to a healthier lifestyle. Get a copy on Amazon here. Are there any Linked tips and other social media marketing strategies you want to share with us? Tell us in the comments.